When you transfer liquids from one container to another, use the Winco SF-6S Removable Stainless Steel Strainer For Winco SF-6 to strain out unwanted bits of food. 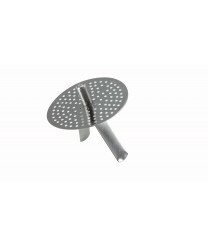 Made of durable, rust-resistant material, this funnel strainer slides into the Winco SF-6 easily, and it fits perfectly, so larger particles can't sneak through. Use the perforated funnel strainer to give your sauces, gravies and dressings the clean, smooth consistency you want. Winco SST-16 Stainless Steel Induction Stock Pot with Cover, 16 Qt. Winco SST-24 Stainless Steel Induction Stock Pot with Cover, 24 Qt.